The Raven Cycle is a quadrilogy of books by Maggie Steifvater, author of The Scorpio Races, the Wolves of Mercy Falls series, and the Books of Faerie series. I had never read anything by her before picking up this series so I can't pass any judgement on her previous writings. All I've heard is that The Raven Cycle is probably her most widely enjoyed series. 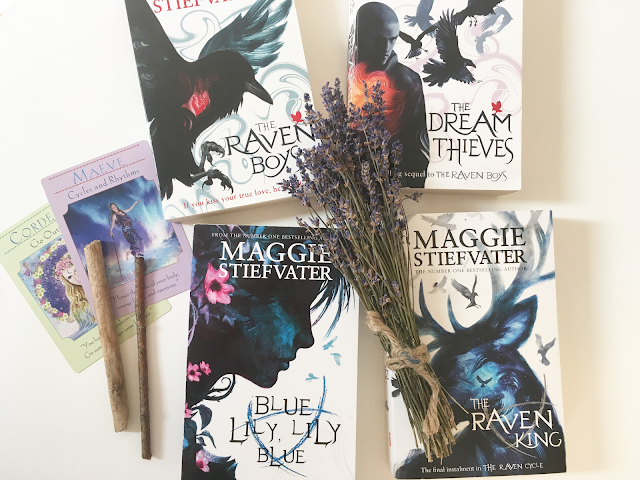 The series revolves around a girl called Blue, her enormous family of clairvoyants and mystics, and a group of boys from the local private school, dubbed 'The Raven Boys'. One night whilst using her powers of boosting energy to aid her mother watch over the 'soon-to-be-dead', she sees a boy about her age's ghost wandering apart from the others. She does not know him, but asks his name. His name is Gansey and he will die in the next year. This is where it all begins. Eventually Blue comes to meet these mysterious (and initially very irritating) Raven Boys and recognises one of them as Gansey. The group becomes close and we learn about Gansey's own mission to find a long-lost king supposedly buried around the town in which they live. He is accompanied by the quiet Noah, the brooding Ronan, and the resentful Adam. Prepare to watch the best development of characters in a young adult fantasy book. Steifvater finely crafts realistic characters with satisfying story arcs without the need for unnecessary drama. These characters can be messy, but they don't act like your young adult protagonist and seem to actually have an iota of self awareness. This, along with a compelling and magical storyline, is the draw of The Raven Cycle. It's hard to go into the story that spans the novels without giving away any spoilers, but it is magical, and it is mystical, and it takes you away to a normal-town world drenched in wonder that feels like it could actually happen. Stiefvater crafts a mythology that sounds straight like it comes from a tale of King Arthur. Throughout I felt inklings of Morgana and Lancelot, but also didn't feel like everything was being spelled out for me. There were gaps in the narrative left where the reader was allowed to work things out for themselves, and that's why this felt like such a stride from the YA I've read in the past. If you like magic and mythology, pick up The Raven Boys. Then The Dream Thieves. Then Blue Lily, Lily Blue. And then The Raven King. Be as pleasantly surprised as I was and spend the moments after you're finished reading a chapter staring into space and feeling that all of what you have read is real. The Raven Cycle was published by Scholastic and the stunning cover art is by Adam S. Doyle.